Hsueh-tze Lee teaches tango full-time now. Hsueh-tze Lee always thought she would have a career in science, but her passion for dance took her in a different direction. Lee, who studied at MIT and had received a doctorate in physiology from Harvard University, was teaching biology at Wellesley College in the 1990s when she discovered that her favorite pastime was becoming more and more important to her. 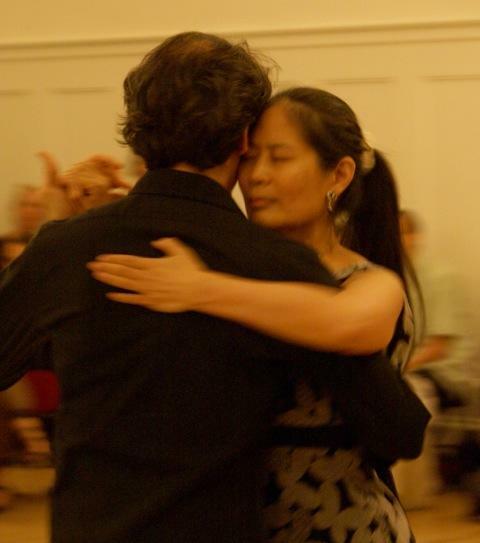 Hsueh-Tze Lee, Boston-area tango master. Lee had been dancing socially since the 1970s, when she discovered folk dancing. By the time she was teaching at Wellesley, she was swept up in the Lindy Hop dance revival that was becoming popular across the country. It was at a Lindy festival on the West Coast where she found what has become her life’s work – tango. The dance started in the 1880s on the border between Argentina and Uruguay. A tango craze spread through Europe and America in the early part of the last century but the dance went through a dormant period in the 1950s. Tango has also been enjoying a revival over the last 15 years. Shortly after learning the dance herself, Lee began getting invitations to teach at tango festivals around the world. It became harder and harder to balance her teaching at the college and her dancing, so in 2001, she made the decision to give up teaching biology so she could teach tango full-time. The shift was surprisingly smooth. “I was able to use what I knew about physiology, about biomechanics, about how muscles work, how we breathe and how we move, and incorporate that into my teaching of tango,” Lee told WCAI. Lee is 61, soft-spoken and graceful, with an engaging smile. She says that tango is a dance for all ages and she plans to keep dancing for many years to come. “If you can walk, you can tango,” she said.